Scribo Displays offer you cost-effective, durable, weather-resistant forecourt display stands with aluminum snapframes and 700 micron PET poster covers which protect your display posters from damage. 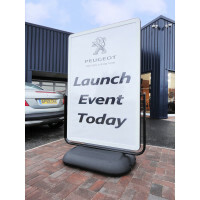 These double-sided forecourt display signs are suitable for displaying vinyl applications. The steel cradles with hard-wearing pivots allow the double-sided forecourt display signs with water-fillable HDPE bases (57.5 litre capacity) to move smoothly on built-in wheels. The smoothly rounded corners of the display stands reduce the incidence of injuries to the users of these forecourt displays. Reach out to Scribo Displays for a demonstration of the effectiveness of their double-sided forecourt display stands.